We had heard of this story from Kürşad! I met Kürşad Kahramanoğlu, I guess, in the spring of 2000. We had met at Kaos Culture Center. Kürşad was an activist who had witnessed LGBTI movement in UK faced with the homophobia of human rights movement and trade union movement and who had fought off in this field. When we shared our trouble related with human rights movement or trade union movement, he used to tell how Britain which we look with admiration today do not have such a bright and flawless past at all and give examples regarding how the human rights, trade union movement had transformed. We had heard of this story from Kürşad years before we watched the movie PRIDE. Or we had the chance to listen to how they raided Amnesty International’s General Assembly in London which celebrated 15. Anniversary of its foundation in Turkey and started to work in LGBTI field as well. When telling these memories, he always used to say to us, “They will change, they have to change, if they do not change they will disappear, we will write this history.” That’s why we always had a peer relationship. After Kürşad’s passing, together with the activists who have been involved in the movement since the early 2000’s, who have been our comrades, who kept each other company in the movement with comradeship, we kept on saying these sentences: “Kürşad used to tell us, we said it was impossible for Turkey, but we are doing it right now,” “Kürşad’s experiences seemed to us so distant but now our movement is progressing on a line that he had experienced and shared with us.” Yes, indeed, while we were more anarchist youngsters in the beginning of the 2000’s, even in those times when we made fun of Kürşad from time to time, he would tell us his concern gracefully and kindly. For an organization like Kaos GL that makes something out of nothing, activists such as Kürşad are highly precious. In a period when social solidarity, organizational solidarity culture are not developed, top of it all, when people refrain from being side by side because of their homophobia, those who are beside you can be counted with the fingers of one hand. For Kaos, Kürşad Kahramanoğlu was one of the fingers of this hand. When we wanted to reach someone from abroad and made them come to our activities, we progressed via Kürşad. For a long time, Kürşad Kahramanoğlu was our greatest reference in international field. When we asked Kürşad something, he definitely always used to give us his recommendations and alternatives one by one. In the movement, activists like me in their 40’s are called “activist of the years” or “dinosaur activist.” I mean, we did not gather something from a previous generation, we could not, there was no experience that we listened to and no legacy that we took over. Kürşad’s experience and the connection that we have with him was, therefore, unique as well. I saw him last in autumn. I had the opportunity to have a chat with him for 2-3 hours. For the first time, we talked over our personal lives but while we are talking about it, we concluded the thing with activism somehow. He advised me “not to forget to be happy and enjoy life while struggling for yourself.” Personally, it saddens me to know that we cannot receive an answer to the question of “Kürşad, how can we do this?” as well as the inability to share with him the thoughts of the old activists at the time we lost him. On the other hand, I am sure that with our constant consultations he felt our trust to him. 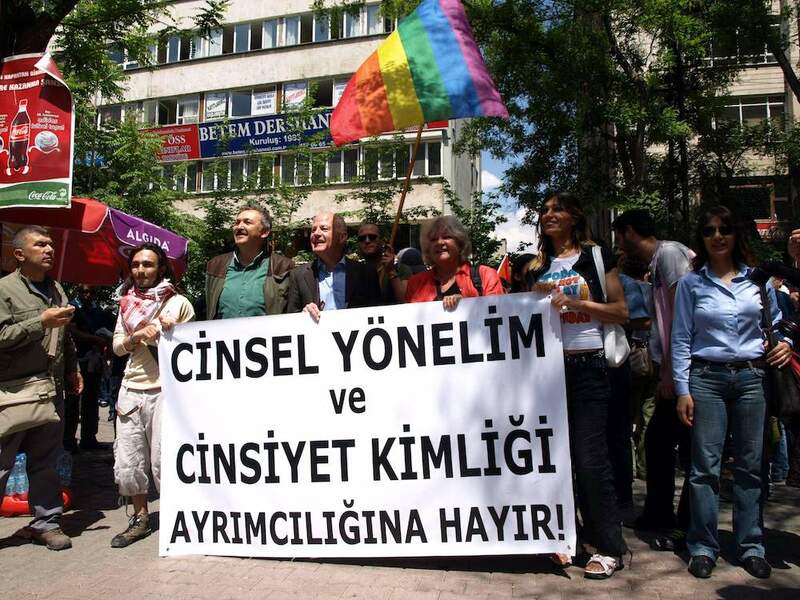 Photos: First 17 of May International March Against Homophobia which is also attended by Kürşad Kahramanoğlu, Ankara 2008.